Samsung has officially taken the wraps off its rumoured flip phone. 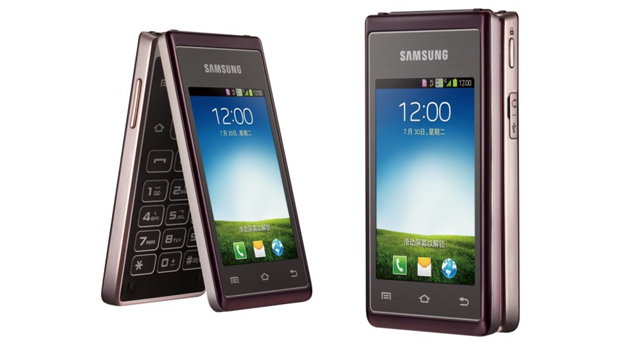 This morning Samsung officially announced the Hennessy, a dual-screen flip phone. Images of the phone was leaked earlier this month. According to Samsung, the phone is headed to the Chinese market. The company currently does not have plans to launch the new smartphone in the UK or US. The Hennessy features two 3.3-inch 320x480 touchscreen displays. It also comes with three capacitive buttons on the front of the handset. It is powered by a 1.2GHz quad-core processor and 1GB of RAM. The Samsung Hennessy also comes with a microSD card slot, five megapixel rear camera, 1500mAh battery, USB 2.0, Bluetooth, GPS and WLAN. The smartphone runs Android 4.1 Jelly Bean and will come with TouchWiz pre-installed. Samsung has also included its instant messaging app ChatON.